The last few birthday cards I made were schlepped together at the last minute. To be honest, they weren't even cards. They were gift tags, because making a tag is faster than a card. Not exactly a proud moment in my card-making career. For my niece's 4th birthday, I purposely set aside some time to work on her card. Mainly because her gift was a magazine subscription which would arrive later in the mail, and so I didn't have anything to give concrete to give her at the party. The least I could do was make a nice card. 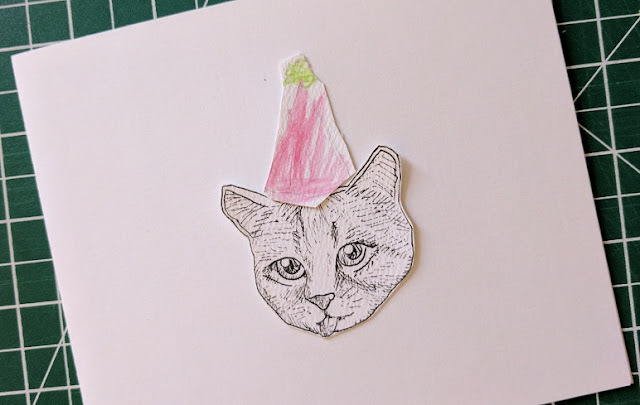 I drew a cat head by copying one from a book, and asked my daughter to draw a party hat to go with it. The result was a credible and spunky birthday greeting. For the inside, I drew the message in bubble letters, and my daughter coloured them in. She took her time to make it nice by carefully selecting brightly coloured pencil crayons and trying to colour within the lines as best she could. We both felt happy about the way it turned out, and we agreed that we made a great card-making duo. Ooh pretty card. I remember getting home made cards from you, which I thought was extra special. I'm not typically a fan of cards but home made ones are different. Oh and it's nice that you and your daughter had an opportunity to do a craft project together!